A beautifully presented barn conversion set in approximately two acres of gardens and paddocks on the edge of the village of Beckwithshaw, with stunning uninterrupted views over the Crimple Valley. The property truly requires an internal inspection to appreciate the well planned accommodation which has been refurbished to the highest of standards and benefits from solid wood flooring, double glazing and oil fired central heating. The accommodation comprises: Beautifully appointed breakfast kitchen with central island, dining area with bi-folding doors which lead to the terrace, living area with wood burning stove, cloakroom and utility cupboard. To the first floor is a master bedroom with en-suite shower room, three further double bedrooms and house bathroom. The current owners have obtained planning permission for a ground floor extension to the rear of the property, further details are available on request. The property is approached via a private lane, leading to gravelled driveway and ample parking. 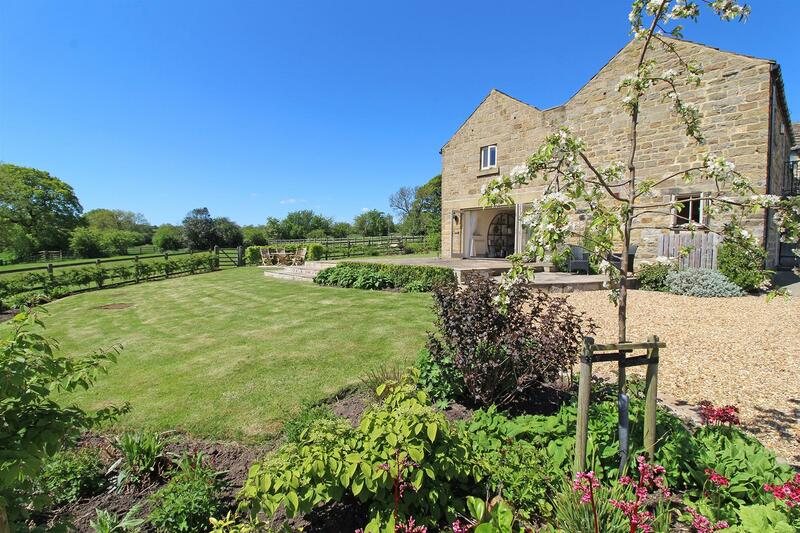 There are skilfully landscaped south facing gardens with a large terrace, borders and lawned areas. Beyond the garden area is a large fenced paddock. From Harrogate take the Otley Road to Beckwithshaw. At the mini roundabout turn left (Otley Road). Shaw Lane is then a turning on the left hand side. The tenure of the property is freehold.